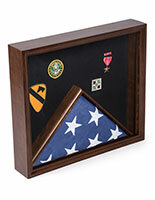 Create a custom memorial to military members with this flag shadow box with picture frame. 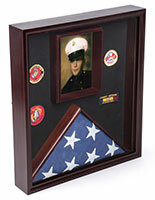 Place 5” x 7” photos alongside pins and medals in the bottom section with a 5’ x 9.5’ tri-fold national banner on top. 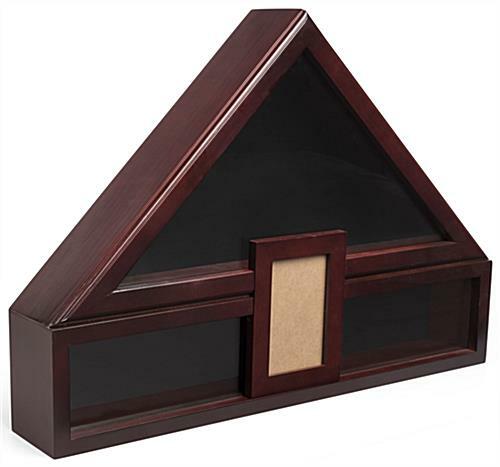 This mahogany shadow box with picture frame has a solid pine build and tempered glass front for a durable display case. 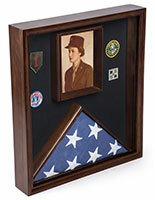 The rear loading design make inserting memorabilia a breeze and the 12” included adhesive tape allows you to securely place pins, medals, and patches. 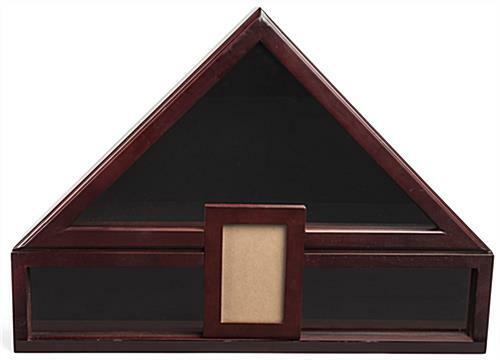 This display case has two placement options with the thick base for resting on your mantle and hooks on the back for mounting. 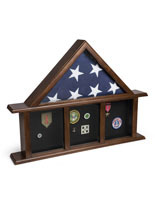 Commemorate military members by putting together a custom showcase of photos, medals, and banners with this flag shadow box. 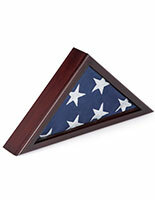 9.3" x 4.0" x 3.3"
Gail, thank you so much for sending along this beautiful picture of your flag case. We're happy to hear that our customer care team was able to provide you with a quick replacement. Your kind words mean the world to us. I ordered 4 flag cases for my school and they arrived in 4 days. They cases are very reasonably priced with a sturdy design and quality craftsmanship. However the packaging is very flimsy. The boxes arrived on my doorstep via UPS ground delivery ($27.00) and looked like they were shipped from Afghanistan. Surprisingly, only 3 of the 4 cases had minor scratches. The customer service dept was very responsive with a discount and to my suggestion of stronger packaging. Otherwise I would rate this product a 5! This display case is beautiful and high quality. 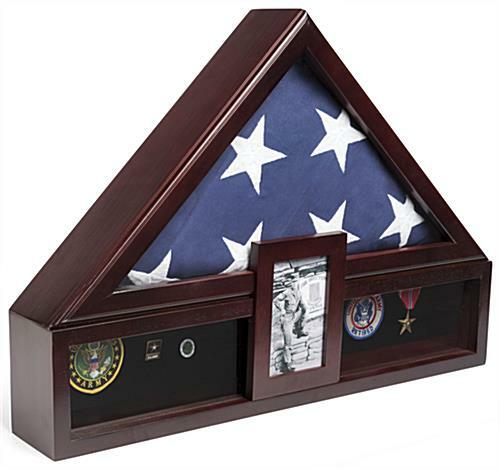 It fits my father's burial flag perfectly and securely. 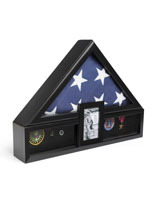 I especially love that it has a portrait frame to include a photo of my father. Just a note, it's a 4x6 portrait (the product description says 5x7). Also it wasn't obvious to me how to get the portrait into the picture frame. 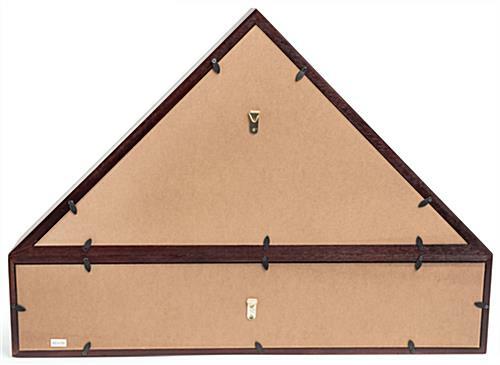 You must pull up on the portrait itself (sliding it up towards the apex of the triangle). Then the whole portrait holder will slide off and you can put the photo into it. I'm looking forward to filling the shadow box portion with some of my father's favorite memorabilia. I highly recommend this case to others. It's even more beautiful in person. Thank you so much for sharing this with us, Linda. We are touched we were able to be a part of such a beautiful memorial. Thank you for taking the time to review and send us your feedback. We hope we will have the pleasure of working with you again in the future!